Amie’s Skin Care sent me two of their products to test out and possibly review on my blog. I decided to put both of the reviews into one post because I rather write one long post than two short ones. I’ve reviewed Amie’s Eye Makeup Remover on my blog as well if you are interested. I always have a package of makeup wipes open. I use them to remove my makeup before cleansing as I find I get a deeper clean that way. I like using them to remove my makeup throughout the day if it starts to bother me and I always take them traveling with me. They are great to have on hand and I have probably tried 15 different brands. Amie Facial Cleansing Wipes are free from parabens, mineral oils, petrochemicals and animal extracts. They say that they are suitable for all skin types including sensitive skin. You get 25 wipes in total, they run for about $6-$7 in store in Canada and are £3.49 on their website. 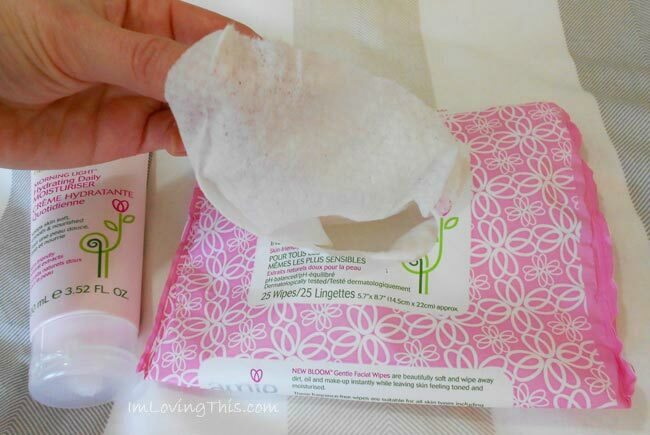 The wipes come in cute pink packing with the typical sticky seal to re-close it. I’m not the biggest fan of this and prefer ones with a snap closure lid. I still buy ones with the sticky closure because all of my favourite brands seemed to be packages this way so it’s not really a big deal. I’m currently down to the last two wipes and my package isn’t sealing closed anymore. I always store makeup wipes upside down to prevent them from drying out, these ones are still moist after being open for over a month. The makeup wipe is the standard wipe size, but is fairly thin. It is also kind of scratchy to my face and doesn’t feel as good the ones I typically buy. I just used one again to be reminded of how they work and I kind of feel like it’s irritating my skin. But it’s nothing alarming. I’m not sure if it is the formula or the actual wipe. There is no residue left behind after using these wipes and they do a decent job removing my makeup. You might need to use two to remove all your makeup as they are kind of thin so I find they don’t retain a lot of moisture while using them. The cleansing wipes are formulated with natural extracts of pomegranate, cranberry and green tea. They are fragrance-free, which is a plus for me as I’m not a big fan of scented products. Amie Facial Cleansing Wipes are ok, but I probably wouldn’t purchase them on my own. I did use up the whole package because they worked but they aren’t my favourite. If you are looking for a paraben free, vegan makeup wipe then these might be something for you. But as for me, I will stick to my regular brands. Amie’s Morning Light Hydrating Daily Moisturizer. Just like the facial wipes their moisturizer is free from parabens, mineral oils, petrochemicals and animal extracts. It also comes in cute pink packaging and you get 100 ml of product. I think this runs for about $10-12 at London Drugs in Canada and is £4.95 on their website. Morning Light Hydrating Daily Moisturizer is a light moisturizer that claims to helps keep skin soft, smooth and nourished. The moisturizer is white, possibly even a faint pink colour and is very light as it claims. It has a faint rose, floral scent which typically I don’t enjoy but once it’s dry I don’t notice the smell it so I don’t mind. It contains rose hip oil so that must be why it smells like roses. A little goes a long way and I haven’t even made a dent in this bottle and have been using it for a few weeks now. I’ve been applying this moisturizer in the morning before my makeup and I find that it keeps my skin hydrated throughout the day. Right now since it is winter, my skin is drier than normal and Amie’s moisturizer helps hydrate it again. I am not going to use this entire bottle up now as I want to see how it does in the summer when my skin is more on the oily side. My makeup applies smoothly over this moisturizer and it doesn’t create any oiliness throughout the day. I’ve tried plenty of moisturizers that caused me to be a grease face within a few hours. Overall I would recommend Amie’s Morning Light Hydrating Daily Moisturizer over their New Bloom Facial Cleansing Wipes. Have you tried any of Amie Naturally Kind’s Line? Let me know what you think of them in the comments below. I’m also interested in hearing about any all natural products that you enjoy. I’m starting to finally finish up some of my skin care items and want to start making the switch to products that are better for my skin.